One of the most basic truths given to us in the Bible is that there is a day of judgment at the end of this age that all must face and that none can escape. The Day of Judgment will be the ultimate courtroom where the Almighty God will settle accounts with every single person. It is the great climax of human history that will lead into eternity, where everyone’s place in eternity will be decided. If you are not obeying Jesus in all things proving repentance by your works and are in one of these abominable circuses(false churches), please, truly repent (confess & forsake all sin) with godly sorrow & child-like faith, humble yourself, and go to “The Way to The Cross” study here https://goo.gl/Qetm4H. Sinners not allowed in church https://goo.gl/x3UKeb. Now people live for today and take virtually no care that God will hold them accountable for how they live. Many seem to get away with their careless attitude towards God and His commandments. Yet nobody is getting anyway with anything at all. The Bible speaks of people storing up wrath for “the day of wrath and revelation of the righteous judgment of God”(Romans 2:5b). Some even dare to shake their fist towards heaven and challenge God to strike them dead. Yet nobody has the right to tell God even when and/or how He should punish them. Nevertheless He has testified that He WILL punish those who rebel against Him and do evil in His eyes. Though some rebels may escape judgment in this life, none will escape the ultimate judgment. Many like to think of God as not seeing and/or caring how we live; or like to think of Him as overlooking mankind’s sins because He is too loving and kind to punish. But those are lies! His love does not provide us a license to mold Him as we wish He’d be and to continue to live as we want to! If you are not living holy and obedient to Jesus who is God, you need to repent & read The Way to The Cross. 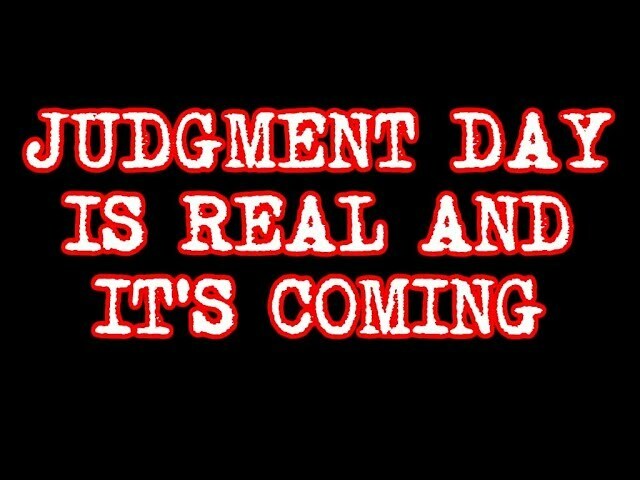 Your judgment day could be today!